Since it seems like almost everyone I know was born within a five-day period in February, today, my sidekick, Greg, is off celebrating, or whatever it is he’s doing for his Valentine’s Day birthday. For all I know he could be home in Brooklyn passed out in bed with his two cats until four in the afternoon, or he could be plastering the country with his resume. It’s his day to do whatever he wants. 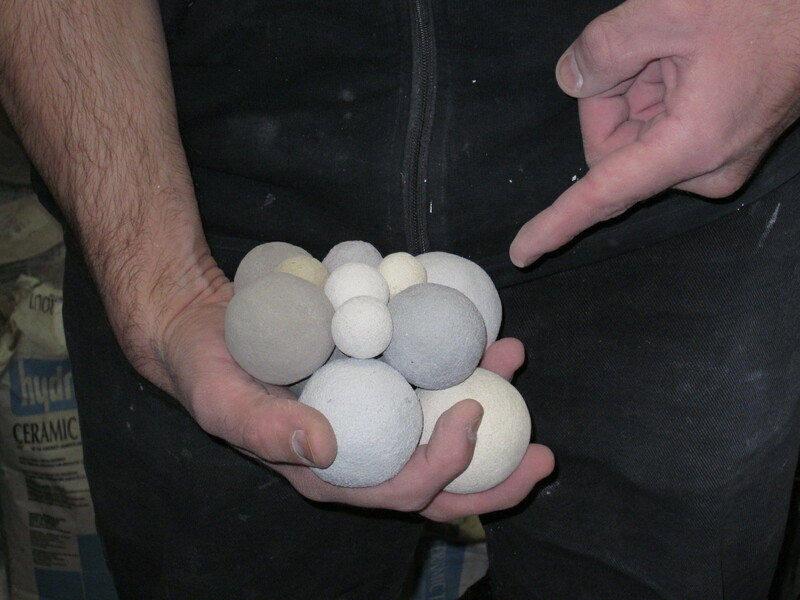 When I find myself walking past the Greg-less workshop today, I will likely glance at his leftover grout ball collection. Greg joins a long line of craftsmen and craftswomen who have made balls in this position, but his predecessors tended to make theirs out of string, tape or rubber bands. I am not sure what it is that brings out the ball-building tendency in my sidekicks through the years, but I do know that the two we had that were insufferably vacant personality-wise and borderline incompetent in the position were not into any kind of ball-building at all. I cannot say this dawned on me until recently when Greg, who is my best sidekick ever, recently revealed the very impressive balls he’s been making over the past year. Greg’ balls are infinitely more original than any produced by his predecessors. This guy would never be mistaken for an amateur. He showed them to me with pride. When Greg is not building tile sample boards as well as more balls from leftover grout, he is a musician and an all-round audio guy. Creative sound design is his life’s true passion. If he is ever taken hostage and his captors forced him to watch the 2011 Grammy Awards; that would be a greater torture for him than stoning by a thousand grout balls. I did enjoy Mick Jagger’s energetic tribute to Solomon Burke very much, although I noticed afterward I felt like I twisted an ankle just watching him sprint and gyrate all over the stage. For a guy pushing 68, Jagger is a phenomenon. If that is a hearing aid in his left ear, it reassures me that he is indeed human. Hearing aid or playback device? I am sure that if Greg saw Mick, he would have been much less impressed. He might have wanted to toss a grout ball in Brenda’s direction. 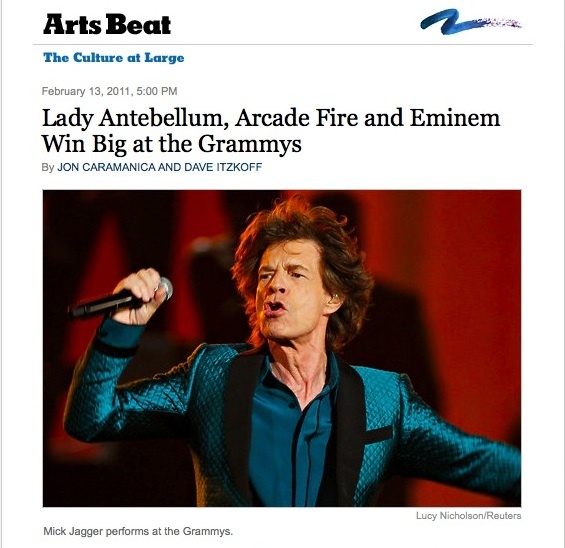 This entry was posted in Humor and tagged balls, grammy awards, mick jagger. Bookmark the permalink.